Caching...! !, its little bit hard to go in brief with single article. But will try to share my knowledge learnt from Heikki / Robert Haas / Bruce Momjian in short. 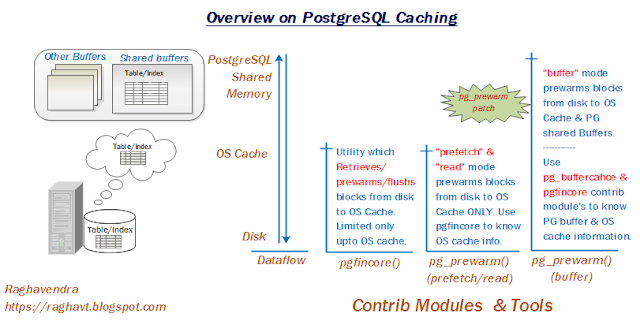 In PostgreSQL, there are two layers, PG shared buffers and OS Page cache, any read/write should pass through OS cache(No bypassing till now). Postgres writes data on OS Page Cache and confirms to user as it has written to disk, later OS cache write's to physical disk in its own pace. PG shared buffers has no control over OS Page Cache and it not even know what's in OS cache. So, most of the recommendation's given by Postgres DBA's/Professional's to have faster DISK / better cache. Caches/buffers in PostgreSQL are stronger like other databases and highly sophisticated. As am from Oracle background (mindset also…:) ), so, my question's from whom I learnt was how/when/what/why etc., regarding Database buffer cache, pinned buffers, Flushing database buffers cache, preloading database etc., I got all my answers from them, however, the approach is bit different. Though my questions were bugging, they answered with great patience and clarifying me to good extent which in result you are reading this blog.... :)..
On some learnings(still learning), I drawn a small overview of how data flow between Memory to Disk in Postgres and also some of the important tools and NEW patch by Robert Haas(pg_prewarm). It has a functionality to give the information about what data in OS Page Cache. Pgfincore, module become's very handy when it is clubbed with pg_buffercache, now one can get PG buffer cache & OS Page Cache information together. Thanks to Cerdic Villemain. Pgfincore, backbone is fadvise, fincore which are linux ftools. You can also use fincore/fadvise by installing source. Two thing, you can use pgfincore contrib module or ftools both result the same. I tried both, they are simply awesome. export PATH=/usr/local/pgsql91/bin:$PATH     //Set the path to point pg_config. Preloading the relation/index into PG buffer cache. Is it possible in PostgreSQL? oh yes, Thanks to Robert Haas, who has recently submitted patch to community, hopefully it might be available in PG 9.2 or PG 9.3. However, you can use the patch for your testing on PG 9.1. BUFFER: reads all the blocks or range of blocks into database buffer cache. I am applying pg_prewarm patch on my PG source installation, you need to tweak as per your setup. Note: Install PG before applying pg_prewarm patch. 2. After download go to PG source location and follow the steps. 3. Above command will create files under $PGPATH/contrib/extension. Now you are ready to add the contrib module. A combination of vmstat,iostat,netstat,top,etc., tool together in one "dstat" linux command. When database behaving unusually, to know the cause from OS level, we open couple of terminals to pull process, memory,disk read/writes, network informations, which is little bit pain to shuffle between windows. So, dstat has serveral options with in it, which helps to show all commands in one output one window. Its designed for working with modern linux system calls including, mincore, fallocate, fadvise, etc. Ftools, will help you to figure out what files are in OS cache. Using perl/python scripts you can retrieve OS page cache information on object files (pg_class.relfilenode). pg_fincore is based on this. You can use pgfincore or ftools scripts. Download the tar.gz from the link. Note: You need to have python & psycopg2 installed before installing python-ftools. Now, we are all set to proceed with example to check with the tools & utilities. In my example, I have a table, it has one index & sequence with 100+ MB of data in it. Query to know the size occupied by table,sequence and its index. I have written small query by clubbing pgfincore and pg_buffercache to pull information from PG Buffer & OS Page cache. I will be using this query through out my example, only pasting this query outputs. Note: I have bounced the cluster to flush PG buffers & OS Page Cache. So, no data in any Cache/buffer. Before, bouncing the cluster I have fired full table sequential scan query on "Cache" table, and noted the time which is before warming the relation/index. Lets warm relation/index/sequence using pg_prewarm and check query plan. To retrieve similar information using python-ftools script you need to know objects relfilenode number, check below. 16787 | icache_seq       /// you can exclude sequence. Now compair the explain plan after warming table into buffer. How to flush/prewarm relation/index in OS cache ? Using pgfadvise, you can preload or flush the relation from the OS cache. For more information, type \df pgfadvise* in terminal for all functions related to pgfadvise. Below is example of flushing the OS cache. Preloading Range of block's using pg_prewarm range functionality. Assume,due to some reason, you want to bounce the cluster, but one of big table which is in buffer is performing well. On bouncing, your table no more in buffers, to get back to original state as it was before bouncing then you have to know how many table blocks were there in buffers and preload them using pg_prewarm range option. I have created a table by querying pg_buffercache and later I have sent block range information to pg_prewarm. By this, shared buffers is back with the table earlier loaded in it. See the example. Note: These are the blocks in buffer. Bounce the cluster and preload the range of blocks related to table into buffers from the "blocks_in_buff". See, my shared_buffer's is back in play. Enjoy…!!! will be back with more interesting stuff. Do post your comments. Very nice job with this detailed overview! Yes very nice article. I see pg_buffercache mentioned but don't see an example of using it in your article. Would be nice to see that too ince that is something people can install more easily than the other tools and take advantage of right away. Thanks. All of the queries, I used has pg_buffercache in it. If you look at Buffer & OS cache info. query it has pg_buffercache. Thanks for Article! I'm new in DB in Caching. The article is very helpful. How can I add the extensions like pg_prewarm/pgfincore in windows? Extremly sorry on that... Am not sure whether they have ever been released for Windows flavor. I say Windows memory management is different from other's, hence you might not find tools compatible of it. This is the behavior when you set "synchronous_commit" to off, and even then, PostgreSQL doesn't really realize its writes are going to the OS cache. With "synchronous_commit" to on, PostgreSQL forces the OS to writes everything to disk (using fsync syscall) *before* it confirms to user, so the data are secured on disk. Yes, very true. I just expressed the default behaviour fsync() call i.e.,(synchronous_commit=off). 1. are those extentions (pgfincore, pg_prewarm) recommended for installing on production database or just only for testing purpose? 2. though we can see what's in os cache and what's in shared memory. what's the best practice for sizing shared_buffers? What's the recommendation on using these two different caches? Very nice! By the way, there is no such word as "clubbing" in the way that you are using it. Duplicate Rows in a primary key Table.